Breathtaking! The blue lagoon has tons of sands, but most of it is underwater. However thats not a problem, who wants to stay out of the water at the Blue Lagoon? The Blue Lagoon is not called blue for nothing. It is the clearest blue you will ever see in the mediterranean. 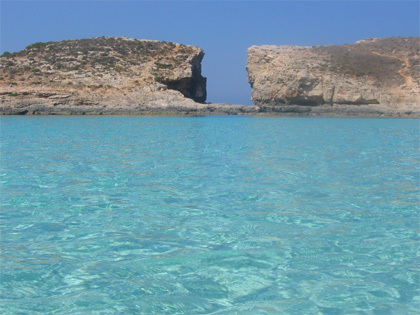 There are no houses in Comino, or an activity what so ever except for the day tourists, so the water stays very clean and clear. There are some spots of sandy beaches here and there, but finding a good spot where to rest your towel and lie down is rather difficult. But rest assured that won't really matter. The sea is shallow and everyone stands in the water hours on end, playing frisbee, ball or just chatting. If you come to Malta, go to Comino and visit the Blue Lagoon. Its a treasure! If you do go to comino, make sure you plan a long day on the Island and try to visit the hot spots we suggest on our Comino Page. Getting there. Most boats from Malta go to the Blue Lagoon, its the most popular spot in Comino.